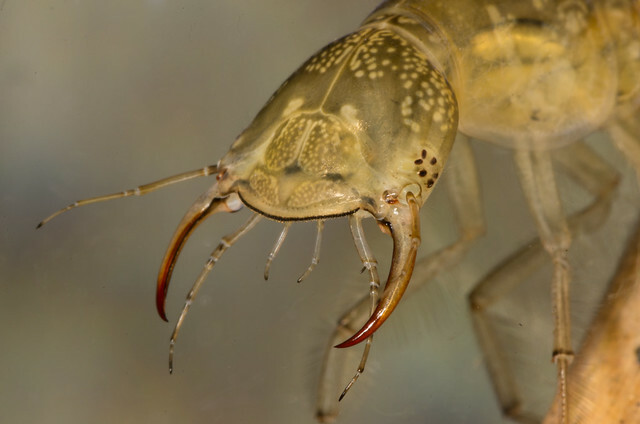 Ive posted photos the larva of a lesser water beetle and the great silver water beetle recently, but the most ferocious of them all are the larvae of the great diving beetle species or Dytiscus larvae. 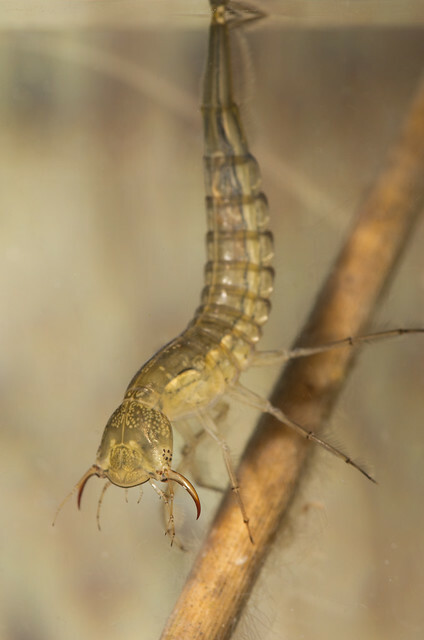 If you mange to get one of these in your pond dipping tray, you will soon end up with just one very well fed Dytiscus larvae and the deflated husks of the other pond creatures – even other Dytiscus larvae! 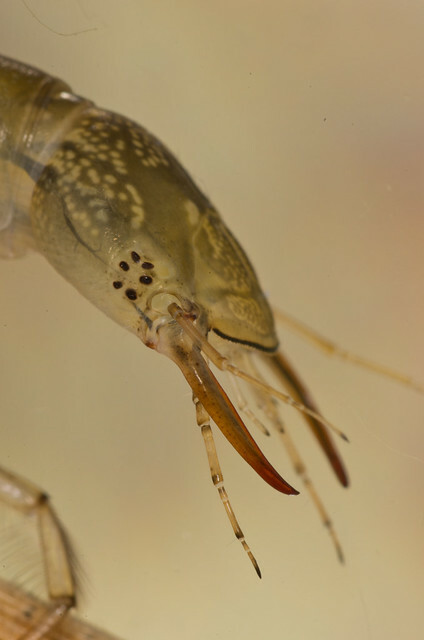 When in the pond or aquarium they tend to sit just below the surface with the end of their abdomen just poking above the water so it can breathe air and their jaws poised to strike. They are quite fearsome close up! And their multiple eyes give them a bizarre look. Have you any idea why the Dytiscus larvae has those multiple eyes? Any purpose they serve rather than having compound eyes like the adults have? I noticed too that not all Dytiscus larvae have the multiple eyes like D. marginalis has. BTW, fantastic shots! Incredibly close up and detailed! Thanks for the comment. I think all Dytiscus have multiple eyes (I may be wrong there though) though Im not sure all the Dysticidae family have multipe eyes. I read a paper on Acilius sp. and all the eyes see a thin band horizontally and as the prey crosses across the differnt field of view of each of these eyes it helps them work out where prey is. I read the paper ages ago, I’ll see if I can find it. My larvae look just like your Acillius ones. Fantastic photos – thanks for sharing them. Thanks, that is very interesting.Are you aware that they feature in H G Wells’ “The Food Of The Gods”? They have been enlarged there to 15cm/6 inches and nearly kill someone.